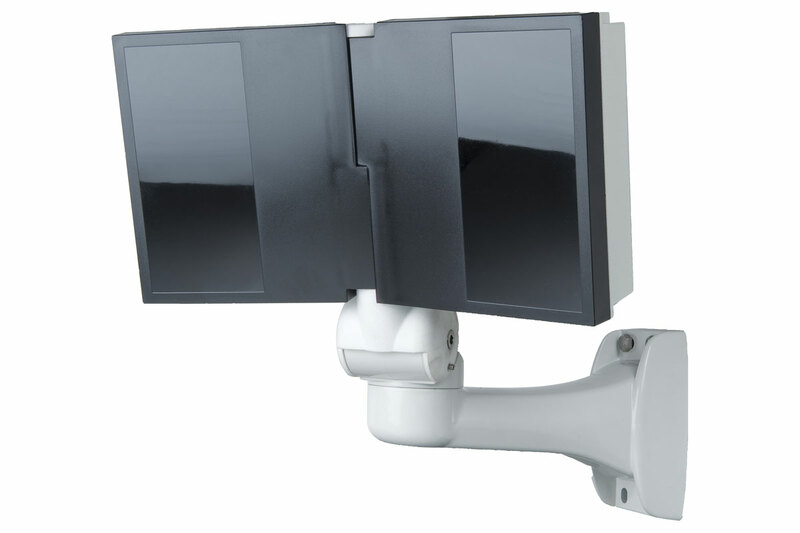 HYPERION is Tekno System® Series of dual-panel infrared LED illuminators, designed to provide optimal image especially for wide areas. The range is made of 4 different spotlight models (15°, 30°, 60°, 120°), whose light beam can be set easily and accurately thanks to its unique adjustable opening system, that allows the installer to regulate the opening/closing degree of the panels as well as the pan/tilt position. The aluminium structure of Hyperion ensures high efficiency thermal yield and maximum LED durability, while the integrated power supply unit makes the installation extremely easy, with no need of an external junction box. Each unit comes with a cable management wall mounting bracket that makes the unit fully vandal proof. Adjustable position through a screw with locking system (see datasheet). Aluminium die-cast moulding and techno polymers. Lenses: 15°, 30°, 60°, 120° (spot). Plug & play installation, no external box required.